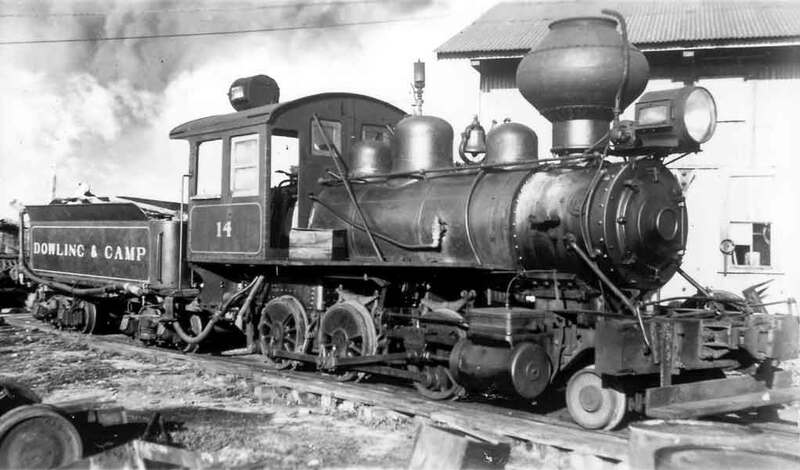 Narrow Gauge and Industrial Railroad History and Photographs. By Donald R Hensley, Jr.
and the late Earnest "Frog" Smith and George Pettengill. All Photos from Donald R. Hensley, Jr. collection unless noted otherwise. Copyright 2003 by Donald R. Hensley, Jr.
Dowling & Camp number 1 somewhere out on the logging line 9 miles south of Alva, Florida. Taken on April 10, 1941 by George Pettengill . Note the loader working in the background. Click here to see the loader. The Slater sawmill and company town was originally built by the J.W. McWilliams Company, Inc. of Ft. Myers around 1924 and was named for a close friend of McWilliams. 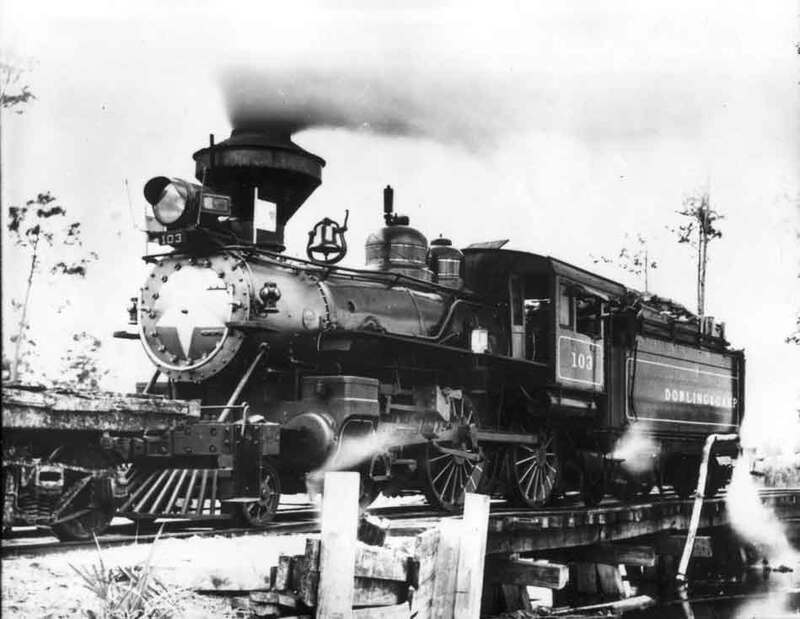 The sawmill and town was built on the Atlantic Coast Line tracks across the river a few miles north of Ft. Myers. Their logging line was built west towards the coast, crossing the Seaboard Air Line tracks at Salvista. When McWilliams logged out in 1929 he sold the mill to the Gulf Pine Lumber Co. which was shutting down their Odessa Mill. William H. and James H. Dowling brought on board Vaughn Camp as a partner and they operated the Slater mill as the Dowling and Camp Inc.
D&C 103 drinking swamp water on a trestle was captured by Robert M. Hanft, circa 1936. 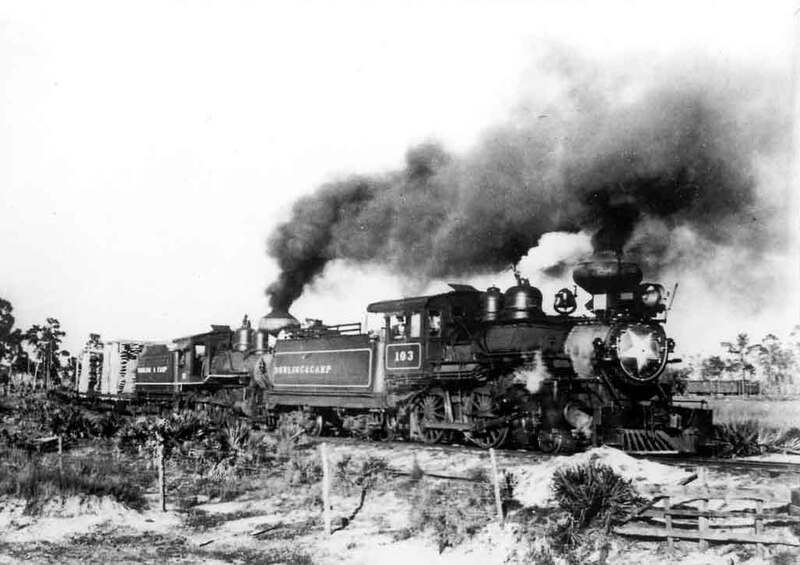 The Dowling and Camp Inc. soon purchased a tract on the east side of Labelle and arranged for trackage rights over the Seaboard through Ft. Myers to Labelle, where Dowling and Camp logging trackage ran southeast into the Piney woods. 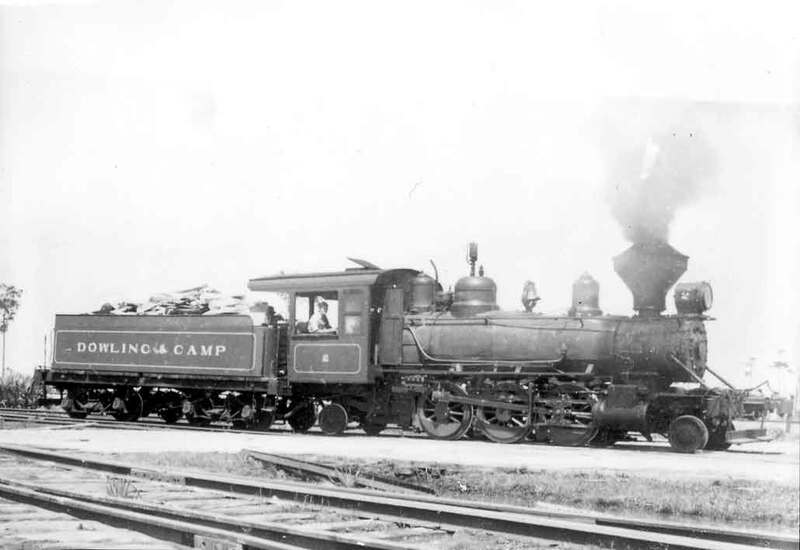 Dowling and Camp used locomotives numbers 103, 170 and later on numbers 10 and 44 as mainline loggers that had to be ICC and Seaboard Certified. The empty log train left the mill about noon time, heading west to the Seaboard crossing a few miles away. The D&C tracks entered the Seaboard tracks at the unincorporated village of Tamiami City using a turning wye. However the nearest agency and billing point was at Salvista so the junction was also known by that name. The North wye track was used for interchange, while the south wye was used for running towards Ft. Myers. The empties would run across the Caloosahatchee River to East Ft. Myers where the interlocking for the Labelle Branch was located. Here the train man was locked in the building until all the switches were realigned for the mainline. 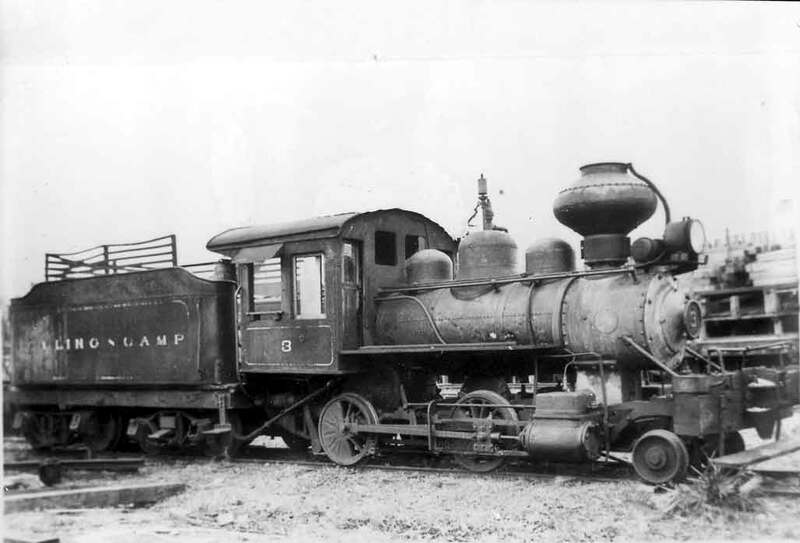 The train would then proceed to the Labelle camp where they would drop off the empties and pick up yesterday's loads, returning to Slater that evening, unloading the next morning before starting the cycle again. D&C 14, a lovely 1911 Vulcan 2-6-0 at the shops at Slater. Photographed on April 10, 1941 by George Pettengill. The Dowling & Camp's logging camp near Labelle was the center of logging operations southeast of Labelle. Here the logging mainline traveled as far east as Atlantic Coast Line's Immokalee Branch and crossed that branch. The logging locomotives such as D&C 1,3,12 and 14 would take over the empties from the mainline locomotives and haul the trains out over the light logging spurs. D&C # 2 was the regular mill switcher. Claude Page is the engineer here. Photographed at Slater on July 13, 1938 by George Pettengill. In the 1940's Earnest "Frog" Smith was the regular engineer of the 2 spot. This little Baldwin Prairie was built in 1920 and was sold to the Lee Tidewater Lbr Co.
and survives to this day at the museum down in Naples. After the Labelle tract was logged out the company moved the camp near Alva and ran a new logging mainline south. Here the schedule of the mainline trains changed because the distances were shorter. The mainline empty train left the mill early in the morning and return early enough in the afternoon to unload before nightfall. A load of lumber being hauled to the Seaboard interchange by a double header train, 103 and 10. While Slater was on the Atlantic Coast Line, they hardly used that interchange. Instead their terms of trackage rights over the Seaboard included a preferred connection agreement between the two. William Dowling died in 1941, leaving his widow, Hallie Dowling in charge. Negotiations on a new timber tract broke down soon after and the Dowling and Camp Lumber Co. soon ran out of Pine to cut. The last tree was sawed in 1944. 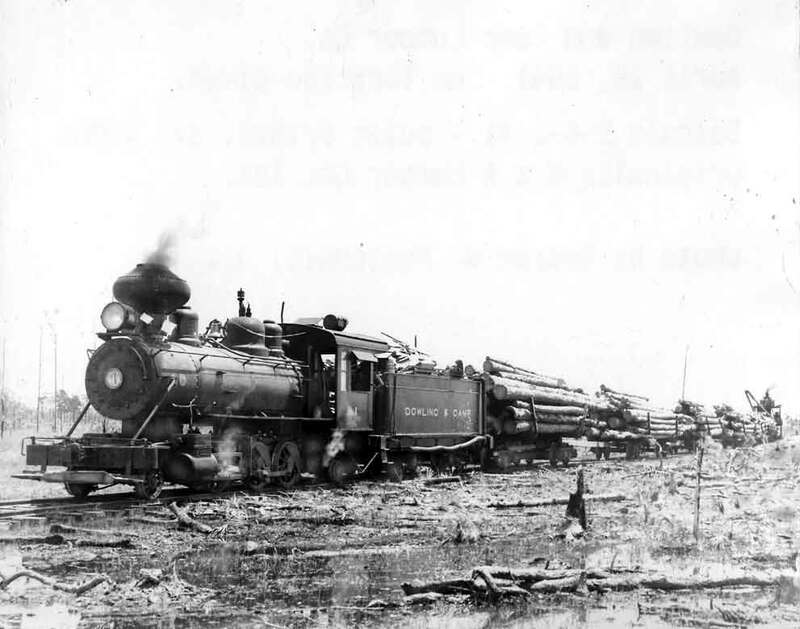 The locomotives and equipment was dispersed or scrapped, some went further south to the Lee Tidewater Cypress Co. Cypress operations in Copeland or the C.J. Jones Lbr Co. Yellow Pine logging at Jerome, Florida. Another cute little Vulcan, the three spot was a rare modern day 2-4-0 built by Vulcan in 1915! Here she was photographed at Slater on March 7, 1936 by George Pettengill. Click here for part 2 , more of George Pettengill's photos. Click here for part 3 , Willie Grant's Photos. Click here for the part 4, the locomotive roster. Click here to return to Tap Lines Index.